A space elevator is a proposed structure intended to transport material from the surface of a celestial body, particularly Earth, into space. Many variants have been proposed, all of which involve moving the material along a fixed structure instead of using rocket powered spacelaunch. The concept most often refers to a structure that reaches from the surface of the Earth to geostationary orbit (GSO) and a counter-mass beyond. Space elevators have also sometimes been referred to as beanstalks, space bridges, space lifts, space ladders, skyhooks, orbital towers, or orbital elevators. Recent discussions focus on tensile structures (tethers) reaching from geostationary orbit to the ground. (A tensile structure would be held in tension between Earth and the counterweight in space, like a guitar string held taut.) However, current technology is not capable of manufacturing practical materials that are sufficiently strong and light to build an Earth-based space elevator. 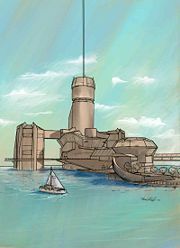 This is because the total mass of conventional materials needed to construct such a structure would be far too great. Moreover, a space elevator would present a considerable navigational hazard for both aircraft and spacecraft. This concept, also called an orbital space elevator, geostationary orbital tether, or a beanstalk, is a subset of the skyhook concept, and is what people normally think of when the phrase 'space elevator' is used (although there are variants). Construction would be a vast project: a tether would have to be built of a material that could endure tremendous stress while also being lightweight, cost-effective, and manufacturable in great quantities. Materials currently available do not meet these requirements, although carbon nanotube technology shows great promise. A considerable number of other novel engineering problems would also have to be solved to make a space elevator practical. Not all problems regarding feasibility have yet been addressed. Nevertheless, the LiftPort Group stated in 2002 that by developing the technology, the first space elevator could be operational by 2014. The key concept of a space elevator dates back to 1895, when Russian scientist Konstantin Tsiolkovsky, proposed a compression structure (that is, a free-standing tower), or "Tsiolkovsky tower," reaching from the surface of Earth to geostationary orbit. He was inspired by the Eiffel Tower in Paris to consider a tower that reached all the way into space, built from the ground up to an altitude of 35,790 kilometers above sea level (geostationary orbit). He noted that a "celestial castle" at the top of such a spindle-shaped cable would have the "castle" orbiting Earth in a geo stationary orbit (i.e. the castle would remain over the same spot on Earth's surface). 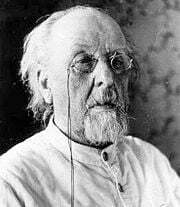 Tsiolkovsky's tower would be able to launch objects into orbit without a rocket. 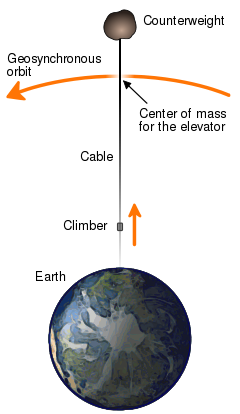 Since the elevator would attain orbital velocity as it rode up the cable, an object released at the tower's top would also have the orbital velocity necessary to remain in geostationary orbit. Unlike more recent concepts for space elevators, Tsiolkovsky's (conceptual) tower was a compression structure, rather than a tension (or "tether") structure. Building a compression structure from the ground up proved an unrealistic task as there was no material in existence with enough compressive strength to support its own weight under such conditions. In 1959, another Russian scientist, Yuri N. Artsutanov, suggested a more feasible proposal. Artsutanov suggested using a geostationary satellite as the base from which to deploy the structure downward. By using a counterweight, a cable would be lowered from geostationary orbit to the surface of Earth, while the counterweight was extended from the satellite away from Earth, keeping the center of gravity of the cable motionless relative to Earth. Artsutanov's idea was introduced to the Russian-speaking public in an interview published in the Sunday supplement of Komsomolskaya Pravda (usually translated as "Young Person's Pravda" in English) in 1960, but was not available in English until much later. He also proposed tapering the cable thickness so that the tension in the cable was constant—this gives a thin cable at ground level, thickening up towards GSO. Making a cable over 35,000 kilometers long is a difficult task. In 1966, Isaacs, Vine, Bradner and Bachus, four American engineers, reinvented the concept, naming it a "Sky-Hook," and published their analysis in the journal Science. They decided to determine what type of material would be required to build a space elevator, assuming it would be a straight cable with no variations in its cross section, and found that the strength required would be twice that of any existing material including graphite, quartz, and diamond. In 1975, American scientist Jerome Pearson reinvented the concept yet again, publishing his analysis in the journal Acta Astronautica. He designed a tapered cross section that would be better suited to building the elevator. The completed cable would be thickest at the geostationary orbit, where the tension was greatest, and would be narrowest at the tips to reduce the amount of weight per unit area of cross section that any point on the cable would have to bear. He suggested using a counterweight that would be slowly extended out to 144,000 kilometers (almost half the distance to the Moon) as the lower section of the elevator was built. Without a large counterweight, the upper portion of the cable would have to be longer than the lower due to the way gravitational and centrifugal forces change with distance from Earth. His analysis included disturbances such as the gravitation of the Moon, wind and moving payloads up and down the cable. The weight of the material needed to build the elevator would have required thousands of Space Shuttle trips, although part of the material could be transported up the elevator when a minimum strength strand reached the ground or be manufactured in space from asteroidal or lunar ore. In 1977, Hans Moravec published an article called "A Non-Synchronous Orbital Skyhook," in which he proposed an alternative space elevator concept, using a rotating cable, in which the rotation speed exactly matches the orbital speed in such a way that the instantaneous velocity at the point where the cable was at the closest point to the Earth was zero. This concept is an early version of a space tether transportation system. In 1979, space elevators were introduced to a broader audience with the simultaneous publication of Arthur C. Clarke's novel, The Fountains of Paradise, in which engineers construct a space elevator on top of a mountain peak in the fictional island country of Taprobane (loosely based on Sri Lanka, albeit moved south to the equator), and Charles Sheffield's first novel, The Web Between the Worlds, also featuring the building of a space elevator. Three years later, in Robert A. Heinlein's 1982 novel Friday the principal character makes use of the "Nairobi Beanstalk" in the course of her travels. After the development of carbon nanotubes in the 1990s, engineer David Smitherman of NASA/Marshall's Advanced Projects Office realized that the high strength of these materials might make the concept of an orbital skyhook feasible, and put together a workshop at the Marshall Space Flight Center, inviting many scientists and engineers to discuss concepts and compile plans for an elevator to turning the concept into a reality. The publication he edited compiling information from the workshop, "Space Elevators: An Advanced Earth-Space Infrastructure for the New Millennium," provides an introduction to the state of the technology at the time, and summarizes the findings. Another American scientist, Bradley C. Edwards, suggested creating a 100,000 km long paper-thin ribbon using a carbon nanotube composite material. He chose a ribbon type structure rather than a cable because that structure might stand a greater chance of surviving impacts by meteoroids. Supported by the NASA Institute for Advanced Concepts, the work of Edwards was expanded to cover the deployment scenario, climber design, power delivery system, orbital debris avoidance, anchor system, surviving atomic oxygen, avoiding lightning and hurricanes by locating the anchor in the western equatorial Pacific, construction costs, construction schedule, and environmental hazards. The largest holdup to Edwards' proposed design is the technological limits of the tether material. His calculations call for a fiber composed of epoxy-bonded carbon nanotubes with a minimal tensile strength of 130 GPa (including a safety factor of 2); however, tests in 2000 of individual single-walled carbon nanotubes (SWCNTs), which should be notably stronger than an epoxy-bonded rope, indicated the strongest measured as 52 GPa. Multi-walled carbon nanotubes have been measured with tensile strengths up to 63 GPa. In order to speed development of space elevators, proponents are planning several competitions, similar to the Ansari X Prize, for relevant technologies. Among them are Elevator:2010 which will organize annual competitions for climbers, ribbons and power-beaming systems, the Robolympics Space Elevator Ribbon Climbing competition, as well as NASA's Centennial Challenges program which, in March 2005, announced a partnership with the Spaceward Foundation (the operator of Elevator:2010), raising the total value of prizes to US$400,000. In 2005, "the LiftPort Group of space elevator companies announced that it will be building a carbon nanotube manufacturing plant in Millville, New Jersey, to supply various glass, plastic and metal companies with these strong materials. Although LiftPort hopes to eventually use carbon nanotubes in the construction of a 100,000 km (62,000 mile) space elevator, this move will allow it to make money in the short term and conduct research and development into new production methods. The space elevator is proposed to launch in 2010." On February 13, 2006 the LiftPort Group announced that, earlier the same month, they had tested a mile of "space-elevator tether" made of carbon-fiber composite strings and fiberglass tape measuring 5 cm wide and 1 mm (approx. 6 sheets of paper) thick, lifted with balloons. On August 24, 2006 the Japanese National Museum of Emerging Science and Technology in Tokyo started showing the animation movie Space Elevator, based on the ATA Space Elevator Project, also directed and edited by the project leader, Dr. Serkan Anilir. This movie shows a possible image of the cities of the future, placing the space elevator tower in the context of a new infrastructure in city planning, and aims to contribute to children's education. From November 2006, the movie is shown in all science museums in Japan. The x-Tech Projects company has also been founded to pursue the prospect of a commercial Space Elevator. In 2007, Elevator:2010 held the Space Elevator games which featured US$500,000 awards for each of the two competitions, (US$1,000,000 total) as well as an additional US$4,000,000 to be awarded over the next five years for space elevator related technologies. No teams won the competition, but a team from MIT entered the first 2-gram, 100 percent carbon nanotube entry into the competition. Japan is hosting an international conference in November 2008 to draw up a timetable for building the elevator. In 2008, the book Leaving the Planet by Space Elevator, by Dr. Brad Edwards and Philip Ragan, was published in Japanese and entered the Japanese bestseller list. This has led to a Japanese announcement of intent to build a Space Elevator at a projected price tag of £5 billion. In a report by Leo Lewis, Tokyo correspondent of The Times newspaper in England, plans by Shuichi Ono, chairman of the Japan Space Elevator Association, are unveiled. Lewis says: "Japan is increasingly confident that its sprawling academic and industrial base can solve those [construction] issues, and has even put the astonishingly low price tag of a trillion yen (£5 billion) on building the elevator. Japan is renowned as a global leader in the precision engineering and high-quality material production without which the idea could never be possible." The centrifugal force of earth's rotation is the main principle behind the elevator. As the earth rotates the centrifugal force tends to align the nanotube in a stretched manner. There are a variety of tether designs. Almost every design includes a base station, a cable, climbers, and a counterweight. The base station designs typically fall into two categories—mobile and stationary. Mobile stations are typically large oceangoing vessels, though airborne stations have been proposed as well. Stationary platforms would generally be located in high-altitude locations, such as on top of mountains, or even potentially on high towers. Mobile platforms have the advantage of being able to maneuver to avoid high winds, storms, and space debris. While stationary platforms don't have these advantages, they typically would have access to cheaper and more reliable power sources, and require a shorter cable. While the decrease in cable length may seem minimal (typically no more than a few kilometers), the cable thickness could be reduced over its entire length, significantly reducing the total weight. Carbon nanotubes' theoretical tensile strength has been estimated between 140 and 177 GPa (depending on plane shape), and its observed tensile strength has been variously measured from 63 to 150 GPa, close to the requirements for space elevator structures. Nihon University professor of engineering Yoshio Aoki, the director of the Japan Space Elevator Association, has stated that the cable would need to be four times stronger than what is the strongest carbon nanotube fiber as of 2008, or about 180 times stronger than steel. Even the strongest fiber made of nanotubes is likely to have notably less strength than its components. Designs call for single-walled carbon nanotubes. While multi-walled nanotubes are easier to produce and have similar tensile strengths, there is a concern that the interior tubes would not be sufficiently coupled to the outer tubes to help hold the tension. However, if the nanotubes are long enough, even weak Van der Waals forces will be sufficient to keep them from slipping, and the full strength of individual nanotubes (single or multiwalled) could be realized macroscopically by spinning them into a yarn. It has also been proposed to chemically interlink the nanotubes in some way, but it is likely that this would greatly compromise their strength. One such proposal is to take advantage of the high pressure interlinking properties of carbon nanotubes of a single variety. While this would cause the tubes to lose some tensile strength by the trading of sp² bond (graphite, nanotubes) for sp³ (diamond), it will enable them to be held together in a single fiber by more than the usual, weak Van der Waals force (VdW), and allow manufacturing of a fiber of any length. As of as of 2006, carbon nanotubes cost $25/gram, and even a minimal, very low payload space elevator "seed ribbon" could have a mass of at least 18,000 kg. However, this price is declining, and large-scale production could result in strong economies of scale. Due to its enormous length a space elevator cable must be carefully designed to carry its own weight as well as the smaller weight of climbers. The required strength of the cable will vary along its length, since at various points it has to carry the weight of the cable below, or provide a centripetal force to retain the cable and counterweight above. In a 1998 report, NASA researchers noted that "maximum stress [on a space elevator cable] is at geosynchronous altitude so the cable must be thickest there and taper exponentially as it approaches Earth. Any potential material may be characterized by the taper factor—the ratio between the cable's radius at geosynchronous altitude and at the Earth's surface." Most space elevator designs call for a climber to move autonomously along a stationary cable. 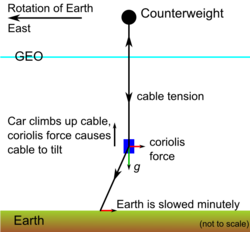 As the car climbs, the elevator takes on a 1 degree lean, due to the top of the elevator traveling faster than the bottom around the Earth (Coriolis effect). This diagram is not to scale. The horizontal speed of each part of the cable increases with altitude, proportional to distance from the center of the Earth, reaching orbital velocity at geostationary orbit. Therefore as a payload is lifted up a space elevator, it needs to gain not only altitude but angular momentum (horizontal speed) as well. This angular momentum is taken from the Earth's own rotation. As the climber ascends it is initially moving slightly more slowly than the cable that it moves onto (Coriolis effect) and thus the climber "drags" on the cable. The overall effect of the centrifugal force acting on the cable causes it to constantly try to return to the energetically favorable vertical orientation, so after an object has been lifted on the cable the counterweight will swing back towards the vertical like an inverted pendulum. Provided that the Space Elevator is designed so that the center of weight always stays above geostationary orbit for the maximum climb speed of the climbers, the elevator cannot fall over. Lift and descent operations must be carefully planned so as to keep the pendulum-like motion of the counterweight around the tether point under control. Both power and energy are significant issues for climbers- the climbers need to gain a large amount of potential energy as quickly as possible to clear the cable for the next payload. Nihon University professor engineering Yoshio Aoki, the director of the Japan Space Elevator Association, suggested including a second cable and using the superconductivity of carbon nanotubes to provide power. There have been several methods proposed for dealing with the counterweight need: a heavy object, such as a captured asteroid or a space station, positioned past geostationary orbit, or extending the cable itself well past geostationary orbit. The latter idea has gained more support in recent years due to the relative simplicity of the task and the fact that a payload that went to the end of the counterweight-cable would acquire considerable velocity relative to the Earth, allowing it to be launched into interplanetary space. Additionally, Brad Edwards has proposed that initially elevators would be up-only, and that the elevator cars that are used to thicken up the cable could simply be parked at the top of the cable and act as a counterweight. The velocities that might be attained at the end of Pearson's 144,000 km cable can be determined. The tangential velocity is 10.93 kilometers per second which is more than enough to escape Earth's gravitational field and send probes at least as far out as Jupiter. Once at Jupiter a gravitational assist maneuver permits solar escape velocity to be reached. In principle, a space elevator might also be constructed on other planets, asteroids, and moons, which have weaker gravity than Earth. A Martian tether could be much shorter than one on Earth. Mars' surface gravity is 38 percent of Earth's, while it rotates around its axis in about the same time as Earth. Because of this, Martian areostationary orbit is much closer to the surface, and hence the elevator would be much shorter. Exotic materials might not be required to construct such an elevator. However, building a Martian elevator would be a unique challenge because the Martian moon Phobos is in a low orbit, and intersects the equator regularly (twice every orbital period of 11 h 6 min). A lunar space elevator can possibly be built with currently available technology about 50,000 kilometers long extending though the Earth-moon L1 point from an anchor point near the center of the visible part of Earth's moon. Rapidly spinning asteroids or moons could use cables to eject materials in order to move the materials to convenient points, such as Earth orbits; or conversely, to eject materials in order to send the bulk of the mass of the asteroid or moon to Earth orbit or a Lagrangian point. This was suggested by Russell Johnston in the 1980s. Freeman Dyson, a physicist and mathematician, has suggested using such smaller systems as power generators at points distant from the Sun where solar power is uneconomical. For the purpose of mass ejection, it is not necessary to rely on the asteroid or moon to be rapidly spinning. Instead of attaching the tether to the equator of a rotating body, it can be attached to a rotating hub on the surface. This was suggested in 1980 as a "Rotary Rocket" by Pearson and described very succinctly on the Island One website as a "Tapered Sling"
The construction of a space elevator would be a vast project requiring advances in engineering, manufacturing, and physical technology. One early plan involved lifting the entire mass of the elevator into geostationary orbit, and simultaneously lowering one cable downward towards the Earth's surface while another cable is deployed upward directly away from the Earth's surface. Alternatively, if nanotubes with sufficient strength could be made in bulk, a single hair-like 18-metric ton (20 short ton) 'seed' cable could be deployed in the traditional way, then progressively heavier cables would be pulled up from the ground along it, repeatedly strengthening it until the elevator reaches the required mass and strength. This is similar to the technique used to build suspension bridges. A space elevator would present a considerable navigational hazard, both to aircraft and spacecraft. Aircraft could be diverted by air-traffic control restrictions, but impacts by space objects such as meteoroids and micrometeorites pose a more difficult problem. With a space elevator, materials might be sent into orbit at a fraction of the current cost. As of 2000, conventional rocket designs cost about eleven thousand U.S. dollars per kilogram for transfer to low earth or geostationary orbit. Current proposals envision payload prices starting as low as $220 per kilogram. West Australian co-author of the book Leaving the Planet by Space Elevator Philip Ragan, states that "The first country to deploy a space elevator will have a 95 percent cost advantage and could potentially control all space activities." 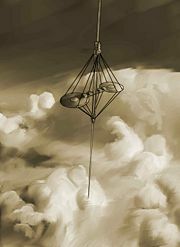 Many different types of structures ("space elevators") for accessing space have been suggested; However, As of 2004, concepts using geostationary tethers seem to be the only space elevator concept that is the subject of active research and commercial interest in space. The original concept envisioned by Tsiolkovski was a compression structure, a concept similar to an aerial mast. While such structures might reach the agreed altitude for space (100 km), they are unlikely to reach geostationary orbit (35,786 km). The concept of a Tsiolkovski tower combined with a classic space elevator cable has been suggested. Other alternatives to a space elevator include an orbital ring, space fountain, launch loop and Skyhook. Space elevator construction discusses alternative construction methods of a space elevator. Space elevator safety discusses safety aspects of space elevator construction and operation. Space elevator economics discusses capital and maintenance costs of a space elevator. ↑ Space Elevator Concept. LiftPort Group. Retrieved December 18, 2008. ↑ Leonard David, 2002. The Space Elevator Comes Closer to Reality. space.com. "(Bradley Edwards said) In 12 years, we could be launching tons of payload every three days." Retrieved December 18, 2008. ↑ Bob Hirschfeld, 2002. Space Elevator Gets Lift. TechTV. - The concept was first described in 1895 by Russian author K.E. Tsiolkovsky in his "Speculations about Earth and Sky and on Vesta." Retrieved December 18, 2008. ↑ 4.0 4.1 The Audacious Space Elevator. NASA Science News. Retrieved December 18, 2008. ↑ 5.0 5.1 5.2 Geoffrey A. Landis and Christopher Cafarelli. 1999. The Tsiolkovski Tower Reexamined. Journal of the British Interplanetary Society 52:175–180. ↑ Yuri Artsutanov, To the Cosmos by Electric Train. Young Person's Pravda. Retrieved December 18, 2008. ↑ J.D. Isaacs, A.C. Vine, H. Bradner, and G.E. Bachus. 1966. Satellite Elongation into a True "Sky-Hook." Science 151:682-683. ↑ J. Pearson, 1975. The orbital tower: a spacecraft launcher using the Earth's rotational energy. Acta Astronautica. 2:785–799. Retrieved December 18, 2008. ↑ Hans P. Moravec, 1977. A Non-Synchronous Orbital Skyhook. Journal of the Astronautical Sciences 25(October-December). ↑ Audacious & Outrageous: Space Elevators. Science @ NASA. Retrieved December 18, 2008. ↑ Bradley Edwards, NIAC Phase I study. Eureka Scientific. Retrieved December 18, 2008. ↑ Edwards, NIAC Phase II study. Eureka Scientific. Retrieved December 18, 2008. ↑ Min-Feng Yu, Bradley S. Files, Sivaram Arepalli, and Rodney S. Ruoff. 2000. Tensile Loading of Ropes of Single Wall Carbon Nanotubes and their Mechanical Properties. Phys. Rev. Lett. 84:5552–5555. Retrieved December 18, 2008. ↑ Min-Feng Yu, Oleg Lourie, Mark J. Dyer, Katerina Moloni, Thomas F. Kelly, and Rodney S. Ruoff. 2000. Strength and Breaking Mechanism of Multiwalled Carbon Nanotubes Under Tensile Load. Science 287(5453):637–640. ↑ Alan Boyle, Space elevator contest proposed. MSNBC. Retrieved December 18, 2008. ↑ Robert Roy Britt, 2005. NASA Announces First Centennial Challenges' Prizes. NASA. Retrieved December 18, 2008. ↑ Britt, NASA Details Cash Prizes for Space Privatization. Space.com. Retrieved December 18, 2008. ↑ Space Elevator Group to Manufacture Nanotubes. Universe Today. Retrieved December 18, 2008. ↑ 19.0 19.1 19.2 19.3 Leo Lewis, Japan hopes to turn sci-fi into reality with elevator to the stars. News International Group. Retrieved December 18, 2008. ↑ Bradley C. Edwards, Eric A. Westling, and Philip Ragan. Leaving the Planet by Space Elevator. Leasown Pty Ltd. Retrieved December 18, 2008. ↑ 21.0 21.1 21.2 B.G. Demczyk, 2002. Direct mechanical measurement of the tensile strength and elastic modulus of multiwalled carbon nanotubes. glue.umd.edu. "2–5 GPa for fibers [2,3] and up to 20 GPa for ‘whiskers’," "Depending on the choice of this surface, σT can range from E/7 to E/5 (0.14–0.177 TPa)" Retrieved December 18, 2008. ↑ Jordan Mills, 2002. Carbon Nanotube POF. Retrieved December 18, 2008. ↑ 52nd Hatfield Memorial Lecture : Large Chunks of Very Strong Steel. msm.cam.ac.uk. Retrieved December 18, 2008. ↑ Paul Lucas, 2003. Orbital Railroads: Beanstalks and Space Fountains. Strange Horizons. Retrieved December 18, 2008. ↑ T. Yildirim, O. Gülseren, Ç. Kılıç, S. Ciraci. 2000. Pressure-induced interlinking of carbon nanotubes. Phys. Rev. B. 62:12648–12651. Retrieved December 18, 2008. ↑ UPC Team Recens’ Answer to NASA's Beam Power Space Elevator Challenge. Polytechnic University of Catalonia. Retrieved December 18, 2008. ↑ Randall Parker, Carbon Nanotube Fibers Tougher, Stronger Than Steel Or Spider Silk. Future Pundit. Retrieved December 18, 2008. ↑ Al Globus, David Bailey, Jie Han, Richard Jaffe, Creon Levit, Ralph Merkle, and Deepak Srivastava. 1997. NAS-97-029: NASA Applications of Molecular Nanotechnology. NASA. Retrieved December 18, 2008. ↑ Blaise Gassend, Why the Space Elevator's Center of Mass is not at GEO. Gassend.com. Retrieved December 18, 2008. ↑ P.K. Aravind, 2007. The physics of the space elevator. Am. J. Phys. 75(2):125-130. Retrieved December 18, 2008. ↑ Hans Moravec, 1978. Non-Synchronous Orbital Skyhooks for the Moon and Mars with Conventional Materials. frc.ri.cmu.edu. Retrieved December 18, 2008. ↑ Hans Moravec: SPACE ELEVATORS (1980). frc.ri.cmu.edu. Retrieved December 18, 2008. ↑ 33.0 33.1 Pearson, Jerome, Eugene Levin, John Oldson, and Harry Wykes. 2005. Lunar Space Elevators for Cislunar Space Development Phase I Final Technical Report. niac.usra.edu. Retrieved December 18, 2008. ↑ Asteroid Retrieval by Rotary Rocket. NASA. Retrieved December 18, 2008. ↑ Tapered Sling. Island One Society. Retrieved December 18, 2008. ↑ Chennai. 2002. Delayed countdown. The Information Company Pvt Ltd. Retrieved December 18, 2008. ↑ Andrew Ramadge and Kate Schneider. Race on to build world's first space elevator. news.com.au. Retrieved December 18, 2008. David, Leonard. 2002. The Space Elevator Comes Closer to Reality. Space.com. Retrieved December 18, 2008. Edwards B.C.E., and E.A. Westling. 2002. The Space Elevator: A Revolutionary Earth-to-Space Transportation System. San Francisco, CA: Spageo Inc. ISBN 0972604502. Edwards B.C.E., and Philip Ragan. 2006. Leaving The Planet By Space Elevator. Seattle, WA: Lulu.com ISBN 9781430300069. Edwards, Bradley Carl. A Hoist to the Heavens. spectrum.ieee.org. Retrieved December 18, 2008. Hickman, John. 1999. The Political Economy of Very Large Space Projects. Journal of Evolution and Technology 4. Retrieved December 18, 2008. Isaacs, J.D., A.C. Vine, H. Bradner, and G.E. Bachus. 1966. Satellite Elongation into a True "Sky-Hook." Science 151:682-683. Krishnaswamy, Sridhar. The Orbital Tower. cqe.northwestern.edu. Retrieved December 18, 2008. SE Roadmap. LiftPort's Roadmap for Elevator To Space. Retrieved December 18, 2008. Space Elevators Face Wobble Problem. New Scientist. Retrieved December 18, 2008. Ziemelis, K. 2001. The great space elevator: the dream machine that will turn us all into astronauts. SpaceRef. Retrieved December 18, 2008. Audacious & Outrageous: Space Elevators. This page was last modified on 14 October 2015, at 16:01.